Teresa and Jeremy Installed a Little Free Library! The Little Free Libraries were started in Wisconsin in late 2010 as a way of promoting literacy and community through the use of small, publically accessible book exchanges. When my husband and I recently went back to Wisconsin for a friend’s wedding, we found ourselves charmed by the variety and number of Little Free Libraries in our old neighborhood, and decided to bring a little of that magic back to Ithaca with us. traffic, so we didn’t need to look farther than our own front yard. But other libraries are located in a wide variety of public and private places – outside of businesses, homes, and schools. We’re book fiends, and always have a stack of books to be passed along to other readers. 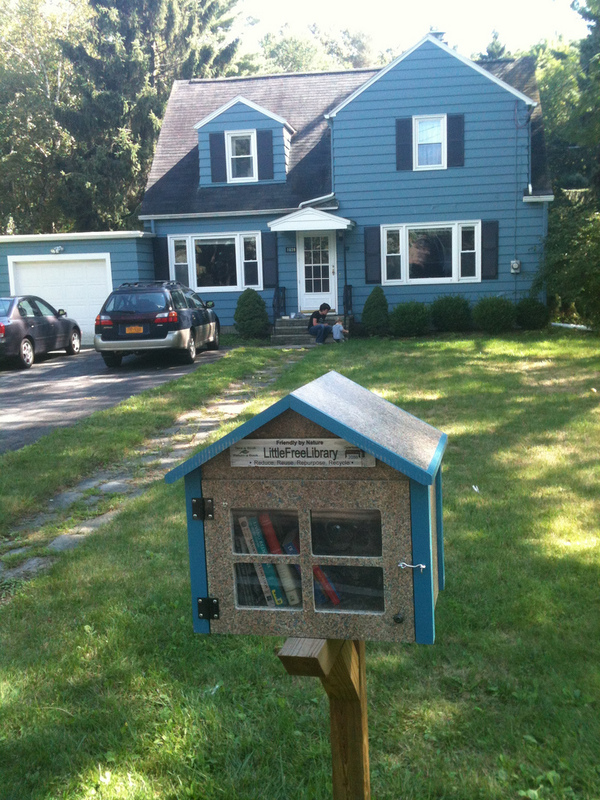 Our Little Library is new, but I hope that it will become a neighborhood resource for exchanging beloved titles. If you’d like to browse the Library and trade some books, or if you want a library of your own and want to see it in person, please stop by 1039 Hanshaw Rd. to check it out! 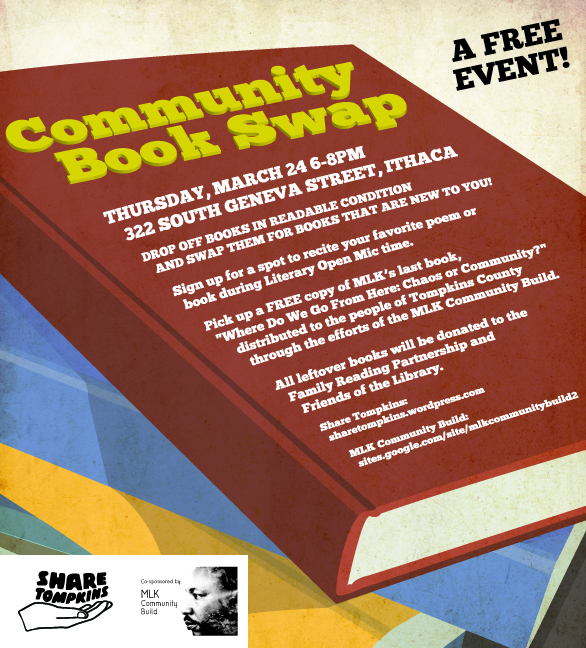 Share Tompkins and the MLK Community Build are co-sponsoring a community book swap! -Drop off books in readable condition or better, and swap them for books that are new to you. -Sign up for a spot to recite your favorite poem or read an excerpt from a special book during Literary Open Mic time. Give a paperback, get a paperback. Give a children’s book, get a children’s book, etc. Also available will be FREE copies of the special edition of Dr. Martin Luther King Jr.’s last book, “Where Do We Go From Here: Chaos or Community?” printed specifically for the people of Ithaca and Tompkins County through the vision and efforts of the MLK Community Build. Children’s book donations will be accepted for distribution to the Family Reading Partnership’s Bright Red Book Shelf program, which recirculates gently used children’s books back into the community where they are made available free for families to own. Usually we ask that unwanted items be taken back, but in this case, all leftover books will be donated to the Family Reading Partnership and Friends of the Library. SO BRING YOUR UNWANTED BOOKS AND READ SOMETHING NEW! Bring a dish to pass if you can, or just check out the goods being offered. We’ll also do a demo of GoGoVerde, a website where we can post offers and requests between our in-person events. For more information, contact McKenzie at grasswriter@gmail.com or 717-903-4871. Get what you need in your very own neighborhood, for barter or worse! Strapped for cash? Like working with your hands? 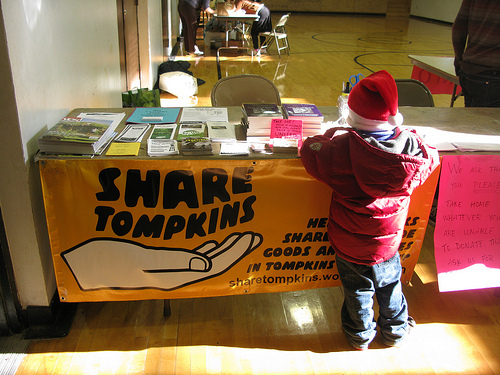 Check off everyone on your list by swapping and making your own gifts this holiday season! All are welcome to this FREE event. 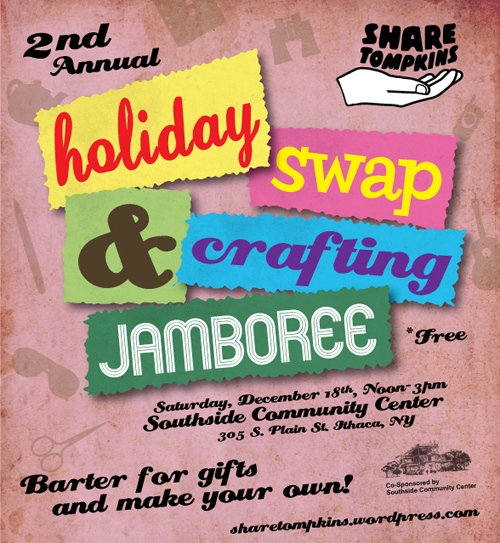 Barter for goodies with your neighbors or make one-of-a-kind gifts at the crafting station run by Ithaca Freeskool. As always, there will be a free area for people who want to give stuff away. Hosted and co-sponsored by the Southside Community Center. You can post haves/wants to the Wall of this event on Facebook or to the Share Tompkins email list. – Materials for craft-making: decorative paper, markers, fabric,etc. – Food: teas, baked goods, jams, chocolate, etc. – Body Care: tinctures, soaps, creams, etc. – Handmade Crafts: ceramics, candles, art, etc. – Stuff: electronics, housewares, books, etc. – Services: massage, yoga, music lessons, etc. – Our goal is sustainability – please bring stuff that is locally-grown or made from local materials if possible, but anything is welcome! – Be prepared to take back home with you whatever you don’t end up bartering or giving away. Left-over items will be donated appropriately. – Please bring stuff that is in good condition or can be easily-repaired – no junk! Our first ever Sound Swap was a great success. We couldn’t have asked for a more beautiful fall day full of sunshine, corn, music and swapping! 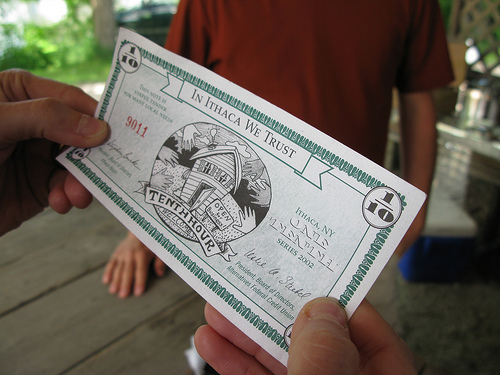 Thanks to the Ithaca Sound Maze for being such a wonderful host.